EventSoundControl is the swiss army knife for the sound of sporting events, small stage shows or theater projects. Usable for the sound of pod- and videocasts and for the streaming of live web radio. It's a soundboard software an many more. You need a software solution for carnival or your zumba event? Try out now! Use software that was designed from the ground up for the musical accompaniment of sporting events, the carnival and for your stage show! With Event Sound Control You have a piece of software that is jingle and music player for events. 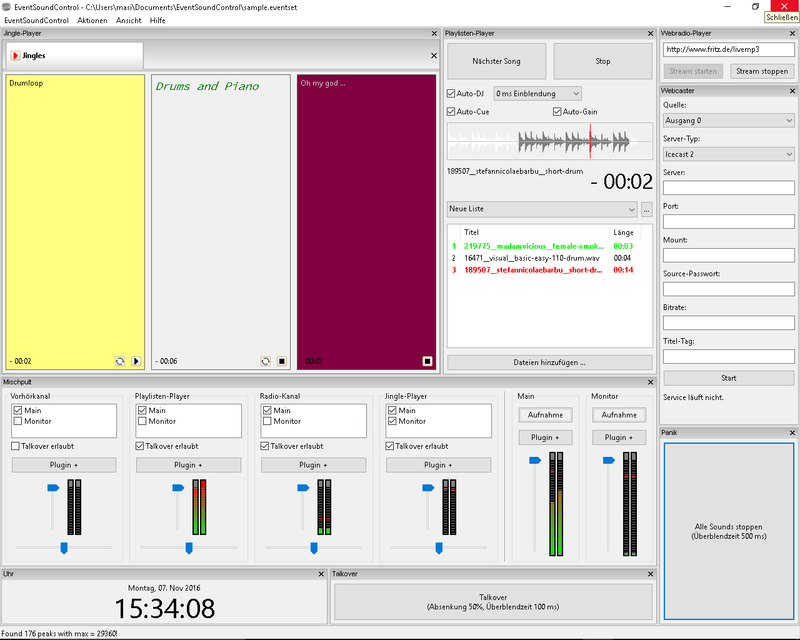 Also streaming software for online radio is included. EventSoundControl is everything you need to take control of the sounds and music for your event. The combination of playlist and jingle player is a basic. The use of ASIO drivers is essential in professional environments. The routing of different sounds with different volume levels through various output channels makes you flexible. With the use of VST plugins you expand the program with key features. All that and more together with a clear and easy to use interface is EventSoundControl. It is the Swiss army knife you need for your show. All in all, EventSoundControl is a professional software solution that enables you to create any combination of music and sounds that you want to play during live events and play them right on time. In addition to purchasing your license, you can support the development of EventSoundControl with a donation via Paypal! You're looking for a piece of software to go online with your webradio? Give EventSoundControl a try! You can send your streams directly from the mixer. You can play playlists and jingles. EventSoundControl is simple to use and has all the options you need for perfect workflow and monitoring. EventSoundControl is the professional low cost alternative to RadioBOSS, Michas Jingle Player, TJingle, Hot Jingle Player, Cuefire, Event Music Machine, Multi Room Audio Player, SoundByte, QLab und much other Apps at the stage. Compare for yourself! Stay informed about news and updates on EventSoundControl! We look forward to your feedback! EventSoundControl is available in English and German. Feel free to contact us if you need it translated to your language or can help on translations.